Not a week goes by in this city without some neighbourhood fiesta taking place. 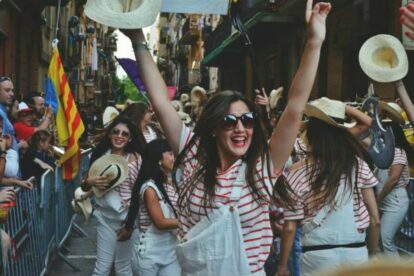 Barceloneta hosts one of the oldest and by definition the real McCoy when it comes to local festivities. La Barceloneta is that weird appendix that sticks out of the city map into the sea, built by military engineers to house dock workers and fishermen, it grew a strong and sometimes combative working class identity. Back in the old days when supplies of fresh produce where not available or affordable to the urban poor, on the feast of the Pentecost, bands of men would venture out to the countryside to barter with farmers and return with the spoils singing all the way. These days the bands or coros carry traditional strings of garlic and also more contemporary necessities like toilet rolls, the emphasis is on the topsy turvy and about having fun. Musical groups parade down the main drags and stop at each business where they play loud music before moving on. Friends from the area tell me that before, the coros were made up of fathers and sons with a bent on the religious side of the festival. Now the groups are made of friends and the focus is on partying hard, so don’t think it over too much and get down to Barceloneta to soak the atmosphere and some cold beers. Pentecost is celebrated falls on the seventh Sunday after Easter, this year the festivities run on Friday 19th and Sunday 21st May.